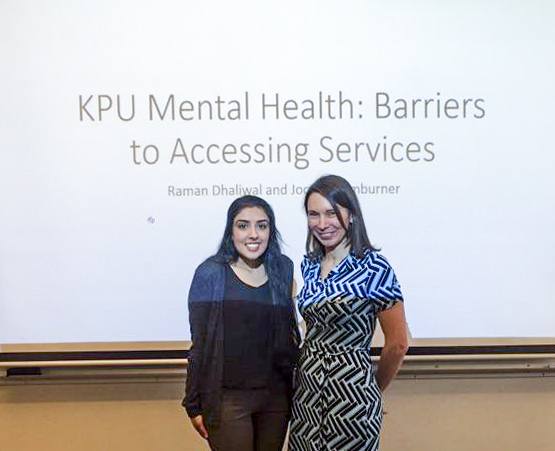 A Kwantlen Polytechnic University student has concluded a study that determines how, why, and to what degree students in need have accessed KPU’s on-campus mental health services. Dhaliwal, who analyzed data from 263 KPU students, concluded that over 85 per cent of students reported experiencing feelings of hopelessness, exhaustion, sadness, depression, and/or being overwhelmed. He surveyed students online and in person by asking them five questions related to both the prevalence of mental wellness issues as well as access to university services, which include personal counseling, peer support, services for students with disabilities, and the prayer and meditation rooms. “53 per cent of students reported experiencing mental health issues that significantly affected their relationships or personal lives,” says Dhaliwal, who also found that nearly the same percentage of students reported that their mental health issues had significantly affected their academic life. In term of access, only 19 per cent of students surveyed had accessed personal counselling, 6.1 per cent of students accessed the prayer and meditation room, 4.2 per cent accessed peer support services, and 3 per cent applied for disability services. While Dhaliwal acknowledges that universities play a significant role in validating and accommodating student mental health concerns, she argues that the promotion of their services can be underwhelming. “Many students are not aware of where these services are located, if they are offered, or if they charge a fee, or if the waitlists are too long,” she says. Other students recommended having regularly scheduled mandatory workshops or orientations throughout the year, rather than just at welcome week. Some also suggested distributing pamphlets and flyers amongst the student body to spread awareness of initiatives and events looking to discuss mental wellness. “Education for faculty members” was also point of emphasis from students, says Dhaliwal, being that instructors are often students’ first point of contact at the university. If professors are not aware of where to refer students in need of support, these support systems may continue to go underutilized. “We can all do a bit more, as members of the university, to help reduce the stigma around mental health and spread awareness so it is not so tricky for students to access services,” says Dhaliwal.